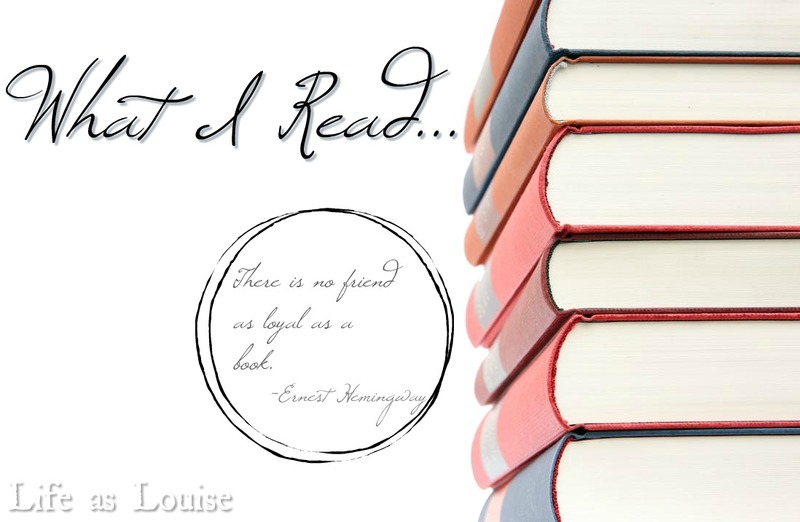 This month’s book roundup is a little light so I added a questionnaire at the end! 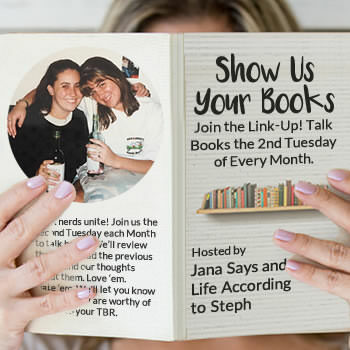 As always, linking up with Steph & Jana for Show Us Your Books!! Happy 4th Anniversary, ladies!!! 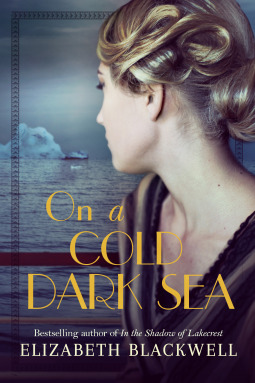 Three women board the Titanic, survive the tragedy, and live to rebuild their lives, but the weight of their choices do not sink with the boat. Twenty years later fate reunites them & old secrets and stories are brought back to the surface. I enjoyed this book, but it didn’t blow my mind. I loved that all three women came from different walks of life and the author opened the book with stories of their lives before the ship sailed. I liked how the story was set up. I thought the jumping around was easy to follow and it definitely added something to the women’s stories. But there were things I didn’t like… First of all, I feel like there wasn’t much of a point. There was a weird focus on romance- the ending was especially odd. It was also kind of slow. I don’t mind a slow pace in a historical fiction, but it reminded me of a British drama- very slow and building, small twists but nothing mind blowing, polite with hints at impropriety. It was a good story about the Titanic and how people felt after they’d survived- I really enjoyed the historical aspect of it. Should you read it? If you enjoy historical fiction, reading about the first half of the 20th century, and British dramas, yes. When amateur socialite detective Amory Ames and her husband Milo are asked to look into drama at a friend’s theater they are both suddenly swept up into a world of acting and mystery. I love this series. Weaver’s most recent book, Villainy, was just released in September and it’s the perfect installment in the Amory story. (I actually rate this book a 4.75 but I round up.) I love that she’s *actually* working with her husband, not against him, and I also love that their marriage is slowly but surely improving. This book had a few repeat characters and many new ones. I didn’t love the theater setting but it didn’t detract from the story in any way. I 100% did NOT see the ending coming, although it’s similar to an Agatha Christie in that I don’t know if there’d been enough signs for me to guess the ending (thus the docked .25 star). I hope/can’t wait for the next Amory story! Should you read it? Yes, but read from the start of the series. I have 165 out of 200 points! I snagged this tag from Sarah Elizabeth! I’ll read any format, but I like hardbacks the best. Brick & Mortar for sure. I resort to Amazon when I need a Kindle book or a hard to find book. Any bookstore near me! I only have a locally owned bookshop in town, though. Usually a bookmark. I’ll dog-ear my own copies if absolutely necessary. What monster throws books away?! Usually keep. Occasionally gift or donate. I don’t have an issue with the dust jacket. I leave it on. I like both 🙂 It just depends on my mood. I don’t have much experience here, but I like anthologies. Usually at chapter breaks. If the authors ends every chapter with a cliffhanger then eventually I stop when I’m tired. It was a dark and stormy night 😉 Not so much thrillers, but adventure or mystery! I like tidy endings. If I’m planning to pick up a sequel immediately, I’m ok with cliffhangers. I like to read on weekend mornings and weekday nights. Harry Potter, The Lunar Chronicles. When I was younger I like American Girl books and The Magic Tree House and books by Eva Ibbotson. The Seven Husbands of Evelyn Hugo (Taylor Jenkins Reid), The Handmaid’s Tale (Margaret Atwood), The Bear and the Nightingale (Katherine Arden), The Art of Racing in the Rain (Garth Stein), And Then There Were None (Agatha Christie), The Sisters Brothers (Patrick deWitt). Alice in Wonderland & the Harry Potter series. 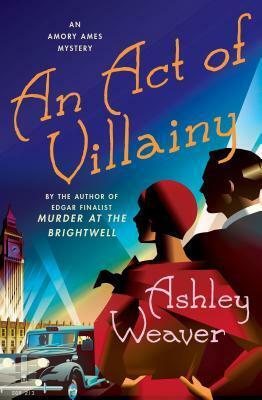 I don’t tend to read very many mysteries, but An Act of Villainy sounds really fun– and I love the cover! I have such a strong love for this author. She’s very much like a modern day Agatha Christie! what a fun questionnaire! but seriously, who throws books away lol. the ashley weaver series is on my list! RIGHT??! I don’t know that I’ve ever thrown a book away. Even the awful ones I’ve donated (though maybe I should’ve pitched them…). I hope you like her as much as I do! Thanks for the reviews – glad you enjoyed them. And fun q&a. I tend to take the dust jacket off the book because I don’t want to wrinkle it while I’m reading, but then I put it back on. Who actually gets rid of dust jackets?? I loved the American Girl books growing up!! I’ve removed the dust jackets before but I usually just ignore them. Haha. When I’m without a bookmark I tend to use the jacket sleeve. The Titanic book looks interesting! I’m weirdly fascinated by the Titanic…when I was a kid, I would scour the Scholastic book catalogues from school for Titanic books and beg my mom for them, haha. I really enjoyed it, it was just kind of slow (and strange at the end). I don’t mind slowness in a historic, though. That’s kind of par for the course in my mind. I love the little questionnaire. Thats fun! & I’m with you – what kind of monster actually throws a book away? That made my heart hurt a little!!! Yeah… I don’t think I’ve EVER thrown a book away! An Act of Villiany sounds really good. I need to check out the series! I also love weekend morning reading- the best! I love her writing- very Agatha Christie. Way to go on Erin’s challenge! You’re almost there! Villiany sounds like a really fun read, but I’m going to add the first in the series to my list because I can’t read out of order. The questionnaire at the end is so much fun! I can’t believe that some people don’t keep the dust jackets! I feel like that would be appalling to have a naked book! Sooo close. I just had to change another book because I. am. determined. I’ve started my two final books so I’m feeling good!! Definitely don’t read out of order- good call! I thought the questionnaire was fun, too! Thanks! I love Titanic stories but isn’t it weird when you read a book and you can’t figure out the point and then you can’t even remember if you read it? This happens to me a lot with historical fiction. Sometimes it’s just forgettable. Very weird. I hate when that happens. The Titanic book was good… just… unmemorable. From your description I kinda want to read on a cold dark sea. Also, I just like historical fiction. As a historical fiction reader, I enjoyed it! Someone who doesn’t read a lot of h/f would probably hate it. Lol. Go for it if it sounds good to you!! So glad to find someone else who loves Weaver’s books!! One reason I was so happy when the Kindle came out was that I never, ever had to giveaway a book anymore. I’ve always lived in apartments so space is an issue and it always broke my heart to give books away, even if they went to a good home. What if I felt like rereading it someday? 😀 I didn’t know Alice in Wonderland was one of your all-time favorites. For whatever reason, I’ve never been a fan of it, which I find odd because it seems like such a Tanya book! I read the first book in the Amory series and enjoyed it. I need to pick up book 2! That makes total sense with the Kindle rationalizing. I don’t mind donating or lending books to others- especially if they’re not my favorite. But Kindle definitely helps the space issue! I love Amory. The first and second books are my other two favs. Three and four were ok, but 1, 2, and 5 were great! Oh my gosh, SUCH good books! I have you to thank for introducing me to The Sisters Brothers. The Art of Racing… hit me so hard. I loved the racing part and I have a babe named Enzo. It all just killed me. I loved it. Do I know about the Amory series? I need to look into that. They’re definitely not thriller or anything like that. More Agatha Christie. But I love her and her growth through the past 5 books. I cant remember if I have added the Ashley Weaver series to my TBR or not.If not, I plan to! I love the cover of that one! I do, too! The Amory Ames covers are always so gorgeous! i just finished “the seven husbands of evelyn hugo” and really enjoyed it too! i need to add ashely weaver to my list – thanks for covering that one! I’m glad you enjoyed Evelyn Hugo! It was such a riveting story. I loved it 🙂 Hope you like Amory as much as I do! Just put a hold on the mystery one! I am in a rut. Thank you! I hope you love it!! It’s kind of special to fall for a new mystery series. I love keeping tabs on this one & the new releases 🙂 I devour them! Wow, you alphabetize your books?! You’re so organized!!! And I don’t usually dog-ear pages, either. I feel like it was burned into me as terrible by my elementary school, haha. Hahahaha- on my main book shelf, yes I alphabetize. On our living room decorative shelves I group them by type and arrange them prettily. I still try to stick to author’s last names, though. Lol. My favorite books that I own are most definitely dog-eared. I try not to but something I have to put it down quickly and can’t find a slip of paper! Thank you for sharing this list! I am always looking for new books to listen to on Audible! No problem! I hope you find a book you love!! I love this survey!! Everyone thinks I am super weird because I organize my books in a very specific way, according to topics that I kind of made up. I don’t let Nick organize the books even though his books are also on the bookshelves. I have a nonfiction section, biography section, children’s book section, cooking section, sci-fi/fantasy section, feminist section, general literature section, old book section, military section. People think it’s weird, but kind of monster doesn’t organize their books at all?? I can’t imagine not having some kind of system!